You are looking at the cover of my new, and first book! This is a very exciting development in my life, and like all the best stuff, the way this book came about has all the elements of being in the right place at the right time. After I graduated with my Masters Degree, one of the things on my list of things to do was write a book, and publish it. I didn't have time while in school but once I graduated, I began writing. I had several false starts; I would begin a book, and begin it, and begin it, and begin it. But nothing felt quite right. Meanwhile, I began working as a minister with the Centers for Spiritual Living, accepting a Letter of Call with Center for Spiritual Living Carson City. While my Masters Degree is in Consciousness Studies and is pretty comprehensive, the degree also qualified me to work as a minister. I began searching for my niche in this new career, and one thing lead to another, and I ended up chatting with Rev. Barbara Leger, who is the Spiritual Director of Temenos Center for Spiritual Living, in Ukraine. Yep, that's right, Ukraine. And part of what her staff is doing is carrying the CSL message of New Thought into treatment centers over there. There only thing is, they are restricted as to what kinds of literature they can use. Enter me, with 20 years experience serving on the board of a treatment center, 28 years of successful recovery, and a New Thought minister with Centers for Spiritual Living! I knew that this would be a niche for me, to create a work that Rev. Leger could use in Ukraine to carry our message. The book almost wrote itself. It was ready to come out. As I was writing, all of a sudden I began receiving phone calls and emails from people, asking if I could help them, as they wanted the gifts of 12 step programs but the traditional language was like a giant wall they couldn't seem to climb. When things like this happen, you know it is right. I wrote the book, found a publisher, Balboa Press, and you can purchase the book in either print or e-version from Balboa Press or Amazon.com. 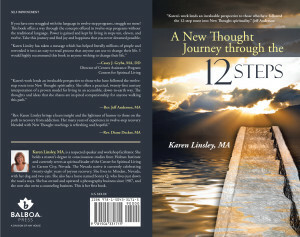 I've also created a web site devoted exclusively to the book, it is www.newthought12steps.com I hope you will join our community!